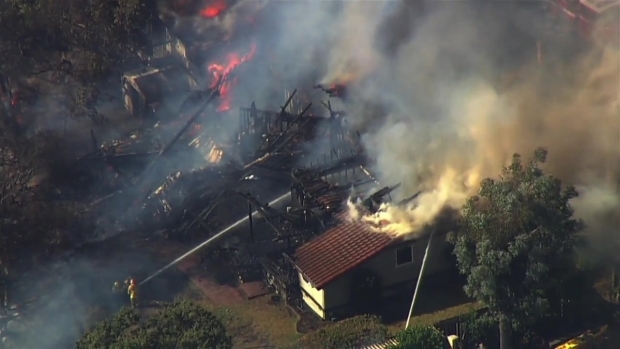 Firefighters on Wednesday continue to monitor a destructive brush blaze that destroyed one home, damaged another and threatened dozens more in the foothills of San Jose's Alum Rock neighborhood. 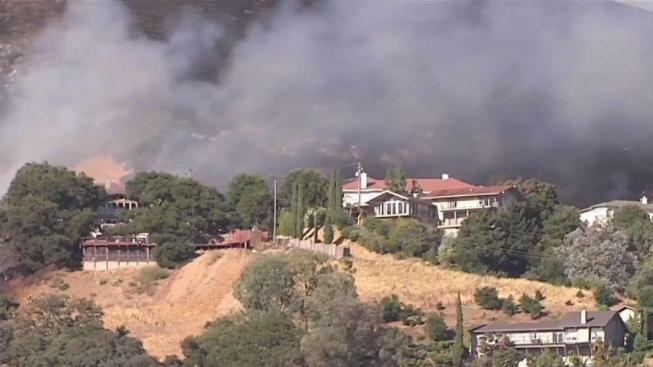 The fire started about 4:40 p.m. Tuesday off McKee Road and Alum Rock Avenue. 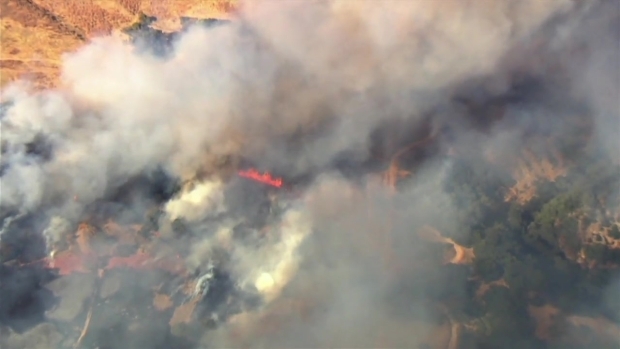 It has since charred 120 acres and is 75 percent contained as of Tuesday afternoon, according to San Jose fire officials. Visible flames could not be spotted Tuesday, but firefighters have yet to establish a full perimeter around the burn scar. "We're looking for fire that's kind of buried within the vegetation," San Jose Fire Department Capt. Brad Cloutier said. "We're also looking at bigger vegetation like trees that may have fire within that. Really what we're trying to do is make sure around the perimeter that we don't have anything that's going to produce any sort of embers that are going to get outside the fire line and get outside our containment." The fast-moving flames came within 20 feet of Hank Selke's home. "I feel very fortunate," he said. "One, that nobody was hurt over here and two, that somehow it skipped our house. I just want to say thank you very much to all the men and women that were out here fighting the fire and serving the community." Kendrick Cheung was able to get out of his house just in time, thanks to a neighbor who alerted him to the approaching flames. "The ashes were flying all over us and getting on our skin. You could feel the heat," he said. When Cheung returned hours later, he saw that the fire had gutted the house next door, but had spared his. "I was scared my house would go up in flames like my neighbors," he admitted. 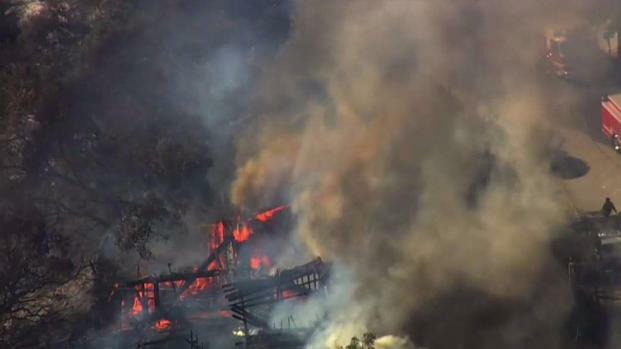 Firefighters on Wednesday continue to monitor a destructive brush blaze that destroyed one home and damaged another in the foothills of San Jose's Alum Rock neighborhood. Bob Redell reports. One firefighter suffered minor injuries but no burns or smoke inhalation. No other injuries were reported. Fire officials said 11 of the 40 homes in the area of Claitor Way and Boulder Drive were evacuated initially. Later Tuesday night, those evacuations were lifted, and residents were allowed to return home. Beneranda Arias said she fled her daughter's house with her 10-year-old granddaughter when she saw flames lapping at their fence. "I could see it was right in front of my house," she said. "I said, 'Let's go. It's too close.'" Arias left so quickly that she didn't have time to get her daughter's dog out of the apartment. The chihuahua, however, was fine, she discovered later. The San Jose Fire Department and Cal Fire responded to the fire. Three helicopters and six airplanes were used to suppress the flames. On Wednesday, crew cut dozer lines behind the homes and removed smoking tree stumps, while neighbors wondered the why the fire chose the path it did and how it sparked.